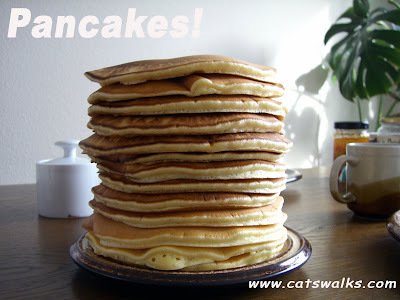 Due to the absence of hotcake (pancake) mixes in Switzerland 4 years ago, I was forced to invent my own pancake recipe. When I arrived, there were only 2 groceries feeding the whole Swiss population of 8,000,000, Coop and Migros. Thanks to the EU, Switzerland was forced to open it's doors to new groceries and new kinds of foods, like the American pancake (vs the french crepe which is paper thin)!. Now, it is possible to find pancake mixes in Coop and Migros but I don't need it anymore because I have found the perfect pancake recipe. Pancakes are made from flour, baking powder, eggs, milk, salt and butter. When you prepare pancakes using a pancake mix, you would need to add eggs, milk and butter. This means that when you buy a ready-mix, all you are buying actually is flour, salt, baking powder and the recipe! Injected by the Americans into Filipino cuisine, pancakes have become a big Filipino favorite! 1. Beat all ingredients together with an electric mixer (or by hand if you want) until smooth. 2. Heat non-stick frying pan add 1 tbsp oil. 3. Using a tissue paper spread the oil evenly into the pan (also remove excess oil). 4. Cook about 1/4 cup of batter for each pancake. Please check out my food blog Bubut's House for more recipes! I kinda miss Pancake House here. Love their chocolate chip pancakes. P.S. Thanks for visiting my blog and leaving your comments there. Thanks for visiting my blog! You know I am a fan of yours. I did not see American pancake mixes 4 years ago in the Migros. It's good anyway at least I learned how to make it myself.